Brooks entered the Massachusetts Agricultural College in 1871 and graduated in 1875. In 1877, he accepted an invitation from the Japanese government to continue the work begun by Clark to establish the Sapporo Agricultural School. His papers consist of writings, correspondence, photographs, newspaper clippings, an account book, and translations. The letters describe in rich detail life in Japan from the perspective of an American teacher trained in agriculture. William Penn Brooks was born in South Scituate, Massachusetts in November of 1851. 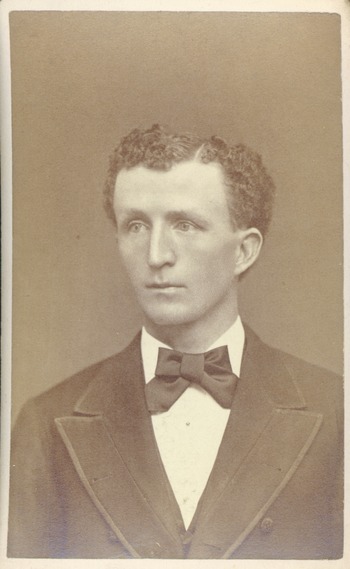 He entered the Massachusetts Agricultural College in 1871 and graduated with high honors in 1875. During his undergraduate years he participated in Dr. William Smith Clark's famous experiments on plant physiology. Brooks remained at Massachusetts Agricultural College as a graduate student in chemistry and botany. During this time, Brooks accepted an invitation from the Japanese government to go to Sapporo to teach. Brooks arrived in Japan in January 1877 to continue the work begun by Clark to establish the Sapporo Agricultural School. Immediately after his arrival he began to deliver lectures on agricultural science and took charge of the directorship of the experimental fields. Brooks worked at the Sapporo Agricultural School for twelve years, four of which he served as the college president. Along with his teaching, Brooks made a great number of contributions as an agricultural advisor for the Sapporo provincial government. He introduced onions, corn, beans, forage and other plants to Japan. In 1889, Brooks was appointed professor of agriculture at the Massachusetts Agricultural College, at the same time he began to serve as an engineer at the Massachusetts Agricultural Experiment Station. During this time he introduced soybeans to the United States. In August 1896, Brooks went to Germany with his family and studied at Halle for one year where he received his doctorate. After his return from Germany, Brooks became interested mainly in experimental enterprises. In 1906 he became director of the Station and he remained connected with the college solely as a lecturer. Brooks was an advisor to the Station until 1921. His contributions to agriculture have been mainly published as reports of the schools, the Experiment Station, the state agricultural department, and the societies to which he was connected. Brooks also authored a textbook in three volumes entitled Agriculture and a collection of his lectures were published under the title Science as Applied to Agriculture. In 1932, Massachusetts Agricultural College granted Brooks an honorary degree of Doctor of Agriculture. In 1924 Brooks's wife died; three years later he married Mrs. Grace Holden. Brooks cultivated his own garden in Amherst where he lived until his death on March 8, 1938, at the age of eighty-seven. In a letter written to one of his students Kingo Miyabe he wrote: "I was born in November, 1851, and to my pleasure I am still living in good health. I can still drive the automobile myself and do all the work in my garden. Nothing gives me more pleasure than cultivating vegetables, fruit-trees, and flowering plants and it is this work that is keeping me in such sound health. Now I have twenty odd kinds of hybrid tea roses and they have been in blossom since the middle of June." The William Penn Brooks Papers consists of writings, correspondence, photographs, newspaper clippings, an account book, and translations. The collection is arranged in four series: Correspondence, Biographical and Historical, Writings, and Photographs. The majority of letters are from William Brooks to his sister Rebecca Brooks during the period of time when he was teaching in Sapporo, Japan. The time span of the letters range from the late 1800s to the early 1900s, and describe in rich detail life in Japan from the perspective of an American teacher trained in agriculture. Brooks's reflections on botany in Sapporo and on his teaching tenure at Sapporo Agricultural School can be found in his letters to his sister Rebecca. These letters frequently refer to Rebecca's failing health and in them William Brooks offers advice to his sister regarding her well-being. It remains unclear what was the cause of Rebecca's poor health, but there are mentions of digestive problems and the need for good nourishment and fresh air. Another topic documented in these letters is the description of life in Japan, including such details as the noise made by frogs, which were numerous in Sapporo, the construction of houses, and the organization of Japanese households. According to Brooks, the Japanese took down the walls of their houses during the day so that the inner arrangement of their houses was displayed. One letter refers to kite flying as a national past time and another letter describes Japanese theater as always based on an historical narrative. Brooks is attentive to plant life and the different kinds of food which are available in Sapporo. In the letters of Eva Brooks to William's sisters Rebecca and Martha, she writes of her domestic duties such as milking the cow, making butter, and a taking trip to various cities of Japan with her daughter Rachel. She itemizes the objects that she bought on this trip in order to bring them back to Massachusetts upon the completion of William's tenure at Sapporo Agricultural School. Also includes photocopies of original material currently archived at the Hokkaido University Library in Japan. These materials include official correspondence and documents from Brooks's time in Hokkaido as well as a letter of protest from the Hokkaido students concerning the lack of opportunity to perform manual labor on the culturally significant farmland. Contains an account book, probably kept by Eva Brooks, dated 1896 to 1923, with pages 16-25 and 46-49 removed. Other materials in this series are newspaper clippings, translations, the biographical sketches of Brooks and the Baron Shosuke Sato, a map of Hokkaido University, and a Japanese poem translated into English by Brooks's students. Also included is documentation of Brooks's role in introducing the soybean to the United States as well as a descendant and pedigree chart for him and his great-granddaughter Cynthia Drew. Historical materials also includes publications by Brooks's fraternity Phi Sigma Kappa. Contains annual reports, bulletins, circulars, crop reports, and summaries of leading conclusions from the Massachusetts Agricultural Experiment Station. Brooks's essays and writings include topics such as alfalfa in Massachusetts, corn, fertilizer use, orchard experimentation, drainage, clover, the fruits and flowers of Japan, and mowings. The photographs consist of portraits of staff and graduating students from three classes at Sapporo Agricultural College as well as scenes of Japan and Massachusetts. Enjoying school. "Sammie and I are in the hen business." Farm work at school. Pleasant view of the mountains from his window. Student response to the death of a classmate. Studies. The College is fixing up student rooms. Enjoying himself this winter. Singing. Stationary. Passed through the scene of the accident in Ashtabula crossing bridge on sleighs. Visited University of California and Mills Seminary. Chances for lady teachers very fine in California. Drought. Japanese houses; Japanese men and women. Kite flying. Sailing for Hokkaido. Visit with Mr. Yuchi (formerly of Amherst) to farm at Nanaye. Otarumai. Sapporo. Purchase of a horse. Visit to the theatre with Penhallow and Weeler. Fourth of July fireworks. Wheeler and Penhallow on surveying expedition to the Ishikari River. Interpretor, Mr. Kojima, is getting married. Japanese marriage customs. New freshman class numbers 18. Recent visit of missionary and acting American consul, Mr. Harris, who has baptised 15 students. None of the converts profess to any particular sect, though Clark "taught them in rather of an orthodox manner." Arrival of Sweat and Treat to teach preservation of salmon. Soldiers return from defeat of the Satsuma rebels, including death of Saido [i.e. Saigo] and Kirino. Eating coquars. Vegetables and Japanese cookery. Harvest delayed by weather, but crops magnificent. Plan to visit salmon fisheries at Ishikari River. Freshman class grateful for lessons on English. Will attempt a proper Thanksgiving dinner. Full barns. Students are gentlemen, faithful and studious. New Years celebration and ceremonies. Fire in Sapporo. College report he sent was largely done before his arrival, but delayed in printing. Snow gone, ploughing has begun. In addition to teaching, he is preparing plans for new building. Has yet to transfer plants from hotbeds to fields. Minister of the Interior Okubo has been assassinated in broad daylight by fanatics opposed to reform. The murderers have been caught and "will be looked upon as heroes, no doubt, by many who think as they do..."
Thanksgiving dinner, eaten on the wrong day. Penhallows wish to have Brooks and Cutter continue to live with them. Servants. Unusual frog noises in Hokkaido. "Photographic fever" among the students at Hokkaido University. Asks about sister's new position. Discusses building a new house at the college. Governor is afraid foreigners will be jealous of his design. Discusses traveling to Nannai. Gives lecture on "Farm Economy". Asked to evaluate land for farming and public works. Mentions student debate exercises in senior class. Having a building constructed for an experiment concerning the manufacture of sugar and syrup from the Early Amber sugar leaf. Governor puts in a propisition with the Chief of the Kaitakushi regarding him. Offered a two year extension that he wants to renegotiate. Discusses producing draining tiles and sorghum syrup, as well as the difficulties in getting the manufacturing facility built. Returns to Sapporo with great cordiality and import, including a meeting with the governor. His new contract describes his position as Professor of Agriculture and Director of the College Farm. Finds success in making syrup and sugar from the sap of the Japanese maple, and discusses plans to raise two new buildings. Complains about Japanese mail system; calls it "in the line of "how not to do it."" On vacation. Describes a visit to Jsu Ishkari to see "the Aino," a people that emigrated from their home country of Saghalien after Japan exchanged it for Russia's Kririle islands. Undertakes an Aino tea ceremony ("some of the worst tea I ever tasted") and converses with a tribesperson, hearing how little they like Japan and how their people's deaths outnumber their births. Brooks theorizes of his interlocutor that "his race will probably become extinct at no very distant day. "NOTEThe Aino (or Ainu) are an ethnic minority in Japan who mostly reside on Hokkaido. Relates how this is the first time that he has gotten out of bed, dressed, and was able to write since he got sick. Describes the physical symptoms of his illness and proclaims that they are receding. He relates that his health is well enough to return to teaching, and that there is deep snow everywhere, such that his rides in the jin rikisha (a hooded light two-wheeled vehicle) are slow. Writing at the end of the Jan. 9th letter, Will explains to his sister that the mail aboard a steamer was damaged in a severe storm, and that's the reason for no mail. Concerned about his sister's health and describes a ride on the newly opened rail-road between Zenibako and Otaro. Talks about how the snow will delay the planting season, and how landslides frequently block railroads. Thinks about traveling through Japan after the school year ends, to see "Old Japan," which still remains. Suspicious of his sister's "Compound Oxygen Treatment"; snow has been gone for a week and farming begins. Dryspell; farming suffers. Working on his speech for the graduation exercises and discusses summer travel plans, including a trip up Mount Fuji. Examines forty-six candidates in Tokio for four spots in the college; has picture taken in Yokohama, and delights over three pecks of apples that the Kaitakushi, or the Hokkaido Development Agency, has given him. Unsure of his future; will unlikely remain at the College in Hokkaido, and would like to return to the Massachusetts Agricultural College. Receives a hopeful letter from President Stockbridge; also mentions the death of President Garfield after Charles Guiteau's assassination attempt. A British steamer has arrived in Otaru bearing railroad iron. The captain is a jolly man who has befriended Brooks and his colleagues. Thinks he will probably agree to be re-engaged to the Hokkaido college for two more years, "...unless an especially good opening offers at Amherst. . ."
Inquires where he will stay when he visits the "old home," and if she will sign for some packages if they should arrive before he. Brooks writes from the Palace Hotel, relaying that the train ride to San Francisco went smoothly except for a minor accident on the train; is visiting family in the bay area, especially Uncle Volney in Oakland. Learns that his boat, the City of Peking, will not depart for four more days. NoteThe City of Peking was a steamship cited by a Naval commander in 1874 to be the fastest ride out of New York, able to go about fifteen and a half knots. Going to sail today at 2 p.m. Has had a "very pleasant time" in California visiting family. Pleasant and fast journey across the Pacific (only 18 days); is the first passenger to physically disembark from the City of Peking onto "Dai Nippon" or "Great Japan." The captain was a pleasant fellow who loved to read and enjoyed discussing and quoting from the best works of time. Brooks is currently staying with friends in Yokohama while awaiting a steamship to Hakodate. On a mail steamer which will carry him North to Hokkaido the next day. Smell almost unbearable; ship previously carried fish. We learn the mail steamer that took Brooks from Yokohama to Hakodate is the "Toyoshima maru," and that the captain is from Boston. Upon arrival, he drops off a "summer hat" to Miss Hampton, which seems to contain many items, although a requested bottle of vaseline was not among them. In the evening, boards another steamer, the "Tokar maru," bound for Otaru. The next day he takes a train to Sapporo where he is met at the station by the entire college (students included). His wife Eva gives birth to a daughter, but three days prior they lost their house and all their possessions to a fire. Describes his sleeping arrangements and the intense winter. Gales have destroyed costal railroads and boats, and temperatures have frozen many wells, including Brooks's. Gives two large lectures in Otaru and Sapporo, the first on Economics and the second on Women's Education. The Sapporo lecture was received by an audience of eleven hundred. Brooks is preparing to take time off as Eva arrives. Storm in Yokohama; Brooks awaits the arrival of the City of Tokio from the Grand Hotel. Complains of the conditions and prices at the Seijoken (Foreign Hotel) hotel when he visited Tokio. 22nd"Eva reached here only last night." Describes a pleasant journey with his wife from Yokohama north on board the stately steamer Takasago. Befriends the captain (an Englishman) and a missionary named Mr. Batchellor. Stops for a break at Oginohama, then proceeds to Hakodate, where at the residence of Miss Hampton Brooks and Eva, along with some missionaries, are "pleasantly entertained." When they arrive at the station he and Eva are greeted by the entire college and by Governor Dzinhio (spelling? ), who brings carriages for each of them. Brooks, Eva, and a colleague go to Otaru. Brooks finds find that the herring fisheries at Otaru "this year had been a failure." Ploughing began earlier this year than usual, on the 20th. Suggests that Rebecca take of up the study of Botany as a healthy and fun pastime; recommends the books and offers to pay for them, as well as the use of his press and drying papers. He writes that he himself is busy cataloging indigenous flora. Discusses an infliction of the eyes; goes to the coast with his wife "botanizing and walking on the beach. . ." Visits Poronai and the Ichikishiri penal settlement where Brooks inspects their farms. Wonders whether the epidemic of Ophthalmia was world-wide or "confined to the Brooks family." He and Eva have entertained many prestigious foreigners, including Sir Harry Parkes, the former English Minister at Tokio, and Consul Wooley of Hakodate. Also included is their friend Mr. Batchelor, a missionary amongst the Ainus. The first three days of July were official holidays on account of the Shokonsha, a period of honoring and remembering "the slain in the late rebellion." The second day featured horse races and the third fencing. Drought on Hokkaido. He and Eva entertain a missionary family, and the other two single missionary women each running their own girls' schools, one in Tokio and one in Hakodate. He and Dr. Cutter are invited to attend the Opening Ceremonies of the new Poronai Railway and Coal Mines, which attracts a Prince representing the Mikado, or the Emperor of Japan, about sixty government dignitaries, and best of all (to Brooks), a brass band. They have the priviledge of meeting the Prince, watching horse races, and attending the Soiree, which is splashed with fireworks and paper lanterns and a second band playing ancient Japanese music that Brooks describes as "caterwauling." In addittion, Brooks and Cutter are invited to a small dinner with General Oyama Iwao, Minister of War. Educated in France in the French military style, he used his knowledge to organize the Japanese Army. Brooks finds him large and "one of the best appearing among all the high officials. . ."
Complains about family correspondence, but happy with Rebecca's. Warm autumn, and has been doing much of his botany work "of seeds of a number of trees and plants peculiar to Hokkaido." These he gives to the horticulturist Mr. Bochmer, who in return provides seeds of Japanese trees and shrubs. Brooks plans to send these home to get planted on his land. Encourages sister in her botanic frustrations. Sends home some items from Japan, including crepe scarfs, a picture book (for the little ones of the family), and some shell beads for Christmas. First snowfalls of the year, but "the ground is not one particle frozen." The senior students are particularly engaged this year, to Brooks's great interest. Also entertaining Mr. Bowen, a jolly San Francisco merchant who buys timber in Japan for the American market. Urges his sister to go to Winterport, or St. John or some other place for a vacation, and offers to pay travel expenses. Describes the Thanksgiving day celebration in Sapporo, including the presence of Mr. Bowen and his chartered ship's captain and the captain's wife, Mr. and Mrs. Howes, from Cape Cod, as well as the mouthwatering feast. Miss Smith, an American living in Tokio, was scheduled to make the dinner but barely missed it. She is up in Sapporo for the winter for her health, and Brooks is happy for Eva, who shares much with Miss Smith. Meanwhile an English nurse is due to arrive today to take care of Eva for reasons unclear. The family moves from Dr. Cutter's house (where they had been staying since their own house burned down) to a new home. Eva and Miss Shaw (the new nurse) travel by jinrikishas, or small two-wheeled vehicles pulled by one runner. Eva has a big abscess on her breast, and though it is healing, it has affected the nursing of the baby. Receives a letter from Professor Goodell asking if he would accept the position of Chair of Agriculture at the Massachusetts Agricultural College (M.A.C.) However, he explains to his sister that an extension of his contract in Sapporo would better realize his financial goals for retirement. Describes the closing (graduation) exercises at Hokkaido University. Also describes a visit to Sorachi, a prison where about a thousand convicts work both on a farm and in a coal mine. The prison farm is overseen by a Hokkaido University graduate. Tells Rebecca that most of them are not murderers because murderers get beheaded, but have probably comitted some less grievious crime such as "stealing a large sum of money." Discusses the diet of the prisoners and also the story of one prisoner who escaped and lived in the nearby woods for twenty-five days eating lily bulbs and snakes. He has now been recaptured and is in solitary confinement for the rest of his life. Wet and rainy in Sapporo. Discusses baby's growth and the acquisition of a new pup. Strangely, all Americans on Hakodate are missing a shipment of mail. Brooks has given two large lectures. Description of Thanksgiving day, and Brooks is excited about the new houses being built for him and his family. Included amongst its features is a basement where the Brooks family can store food, provisions, and seasonal clothing, for "If burned out again we mean to have somethng left to begin over again with." Also has trained Eva's horse to pull a Russian-style sleigh. Asks Rebecca if she will be his "American agent" who will collect and dry whatever specimens the Japanese botanist desires that Brooks may obtain valuable Japanese flora. The Brooks have replaced most of everything lost in the fire and they expect to move into the new house in a few days. Tthe ordered rugs from San Francisco have arrived, and the furniture (made from native woods like cane) are nearly in order. Ends letter with Japanese salutations. The steamer San Pablo, carrying American mail to Japan, was forced to return to San Francisco after twenty-nine days at sea, Brooks reports. At college, some classes are good, some "like tooth pulling." At end, refers to Rebecca's spring schedule, including chicken raising. Describes methods of botanical collection and how to poison the specimens to keep insects away. Rae (the baby) is now springing teeth.Holds party for some graduates of the college and their wives. (Eva is now adept at making French confectionary). March 20th was celebrated as the "Vernal" holiday in which the Japanese honor the deceased members of the Imperial family (also says that Japan celebrates a similar holiday in the Autumn). The college students also take advantage of a clerical error to skip school for an extra day. Brooks says that they will regret it. Going to give a lecture in Sapporo, and also invites Rebecca to come to Hokkaido to see if she can get a job teaching. (Out of order)Back in Sapporo, Brooks comments on Boston's harsh winter, and how he has never known Sapporo have such harsh and damaging winds. Is inquiring about Rebecca coming out to work in Sapporo's preparatory school, and observing the development of Rae. Tells Rebecca that she must write on the schedule of the steamers, or about every twelve days. Also relates of the Stockbridge's arrival, and that "Sapporo Holiday" is two days hence. Rebecca will not be coming to Japan; Will discusses affairs in Massachusetts; will go to Tokio soon for a dentist. Gets pictures taken of himself and Rae in Hakodate, but they come out horrible because Rae "behaved like midget, wouldn't stay still one second. . ." Gives strict instructions on the dispersal of the photos, as "I don't want such photos widely seen as representing a child of mine." He and Eva go to Hakodate for dental work. Good description of travel within Japan. The "Hakodate ladies," Miss Hampton and Miss Hamisfar, come to visit them for a few days, and the house is very crowded, as the Batchelors are also staying, Mr. B for his health. "There have been more foreigners here this summer than ever. . ." including a Yankee setting up milling machiens in Japan under contract. Beautiful description of the area around Brook's house. Also says that since the mail flow has been temporarily broken between America and Japan, their mail has been coming via Europe instead. Seems to be trouble between steamer companies and possibly between politicians. Brooks is excited about Rebecca's interest in botany and vows to support her, buying whatever books on the subject she desires. Encourages her to pursue it, that she might soon be able to become a teacher in a high or boarding school. The Stockbridges lose their five-day old baby. Interesting discussion of late 19th century Christian religion that arises regarding the funeral of the little boy (for whom a Japanese Christian graduate of the college performs a service, followed by the service of a French Catholic priest). Brooks still healing his eyes; Eva and Rae are away on a shopping/visiting/vacationing spree---good descriptions of travel and sociability in late 19th century Japan; they go by steamer, by sleigh, and by carriages and are entertained with feasts. Description of the island and of Hakodate road, and of regions of pasture land. Says that staying in Japanese hotels are the hardest part of traveling in Japan, since they have no stoves but only hibachis, or charcoal-boxes to heat up individual rooms. Mrs. Stockbridge has given birth to a new baby boy. Uncle Volney has died. Rebecca sick. Sentimental letter concerning Brooks's feelings of indebtedness to his sisters (it seems like he is the youngest child). Eva is pregnant again, due in August. Suggestions for improving agricultural experimentation at the college. Brooks has accepted a position in Amherst, but knows that it will be hard to leave Sapporo. Though Amherst offers him less money and no house, Brooks writes that the affinity for old friends draws himself and Eva to America ("I think neither of us care much for the so called "advantages of civilization:" there are too many attendant disadvantages"). Cautions Rebecca not to get overtired. Brooks expects to arrive by mid-December. Eva has given birth to a son six days before, and both parents agree to give him a Japanese name "if we can find one which would not be too outlandish to the American ear." Stays in Revere because the weather and the wind are too much for the baby (1 degree) to be outside too much, and all the Greenbus trains are either too early or too late. Baby had a little difficultly with the journey and the change in daily routine. Brooks likes his new house, but also finds it a bit large. Looks forward to Rebecca moving in. One of his duties at Mass. Aggie will be oversight of the Experiment Station. He also meets with President Goodell and visits the elder Stockbridges, whose son and family have just arrived from Japan. Christmas dealings; Brooks says he will not travel with the baby still recovering from its cold. Brooks, Eva and Rae attend a wedding near Boston, and travel by a combination of train and "hacks". On the way home Brooks misses his train because of a drawbridge raising. Hackslang for a hackney carriage, or in this time a horse and carriage with a driver and operated like a modern-day taxi cab. Goes to Washington to attend a conference of "workers in Experiment Stations." Then goes to Boston to take care of some business regarding some boxes from Japan. A customs official comes to Amherst shortly thereafter and drops the packages off. Will give a lecture in Hadley about farming in Japan. Plans a trip to Revere with his family, should the weather be all right. Asks them to arrange to have a "closed carriage and a good horse to meet us." The boy is named Sumner. Excellent description of travel in New England, especially to cities, and perhaps the custom of writing back those you visited when you got safely home? Attends the funeral of a mutual friend/acquaintance. Brooks returns from vacation on the shore and thanks his sisters for housesitting. Talks about his hens and their egg-production. Also concerned about Rebecca's health and livelihood and wants her to come and live with his family. Discusses his children's development. Talks about how his sisters can redeem their bills at either the National Bank or the U.S. Sub Treasury in Boston. (written on M. A. C., Office of the Professor of Agriculture stationary). Brooks acts as an investor for his sisters. (written on M. A. C., Office of the Professor of Agriculture stationary). Intending to set eggs in an incubator and raise a hundred new Plymouth Rock chickens. Brooks is preparing to file a complaint against a man who unlawfully cut some of his woods down. Eva complains about the cook letting her do all the kitchen work, "under the plea of his wife's sickness," and also that while the family is materially comfortable, they "want ideas more than anything else" and suffer from a lack of intellectual and social stimulation. Relates that a student broke into the farm office, stole six-hundred and seventy-eight yen, and invited other students to come with him and enjoy the prostitution houses. Brooks writes that Investigation and punishment is underway. Meanwhile, he has agreed to head a program teaching students of the common schools of Sapporo in "practical agriculture"; also urges his sister and his other correspondents to write more frequently and at greater length. Book cover: Hall, Eva B. Memorandum: Brooks's appointment and salary at M.A.C. Report of Gathering in Honor of Brooks, William P.
Summary of Leading Conclusions. Twenty-First Annual Report. Part I. Summary of Leading Conclusions. Twenty-Second Annual Report. Part II. Summary of Leading Conclusions. Twenty-Third Annual Report. Part II. Summary of Leading Conclusions. Twenty-Fourth Annual Report. Part II. Transactions of the Massachusetts Horticulture Society, For the Year 1890. Part 1. Donated by Ben and Emily Drew and Cynthia Redman in October of 2004. Ben Drew and Cynthia Redman are descendants of William Penn Brooks. Brooks's letters from Japan have been digitized and may be viewed online through SCUA's digital repository, Credo. Processed by Rachel Gugler and Sam Arthur, December 2004 and October 2018. The following is a list of sources consulted during the preparation of this finding aid. Maki, John M. William Smith Clark: A Yankee in Hokkaido. Hokkaido University Press, Hokkaido, Japan, 1996. Miyabe, Kingo: "A Brief Biography of the Late Dr. William Penn Brooks." Rand, Frank Prentice. Yesterdays at Massachusetts State College. The Associate Alumni Massachusetts State College, Massachusetts, 1933. Cite as: William Penn Brooks Papers (RG 003/1 Brooks). Special Collections and University Archives, W.E.B. Du Bois Library, University of Massachusetts Amherst. Massachusetts State Agricultural Experiment Station.